A Sea Fury at Oshkosh 2009. Copyright: Dave Snyder, 2009. It’s interesting how conversations can rapidly move from one subject to another in an instant. The other day, a few friends and myself were discussing the legendary Miracle On Ice at the 1980 Winter Olympics, when the topic turned to aircraft and the Republic P-47 Thunderbolt, also known as “the Juggernaut” to the USAAF pilots who were privileged with flying it. Quickly, another aircraft was introduced- the Hawker Sea Fury, and my mind began to wander. The Sea Fury was a fairly formidable aircraft in its own right, its Bristol Centaurus granting it a proper top speed of 460 mph, and its wings able to carry a decent payload of munitions. In true Ian style, I began pitting the Sea Fury against other aircraft of the time in my mind and was curious enough to do some research. That’s when I came across the story of Lt. “Hoagy” Carmichael (not THAT Hoagy Carmichael), and a MiG-15 that had the misfortune of incurring Carmichael’s fury (see what I did there?). You don’t often hear about piston-powered fighters going up against jet-powered fighters in history books. This is mostly because the advent of jet fighter aircraft came towards the end of the Second World War, too late for them to make any real impact on the war. With VE Day coming soon after the introduction of the Messerschmidt Me 262 (the first true fighter jet), not many Allied pilots ever got the chance to face it. Among the few who did, a talented young USAAF pilot by the name of Chuck Yeager deftly and skillfully took out an Me 262 the first time he encountered such an aircraft… with his North American P-51D Mustang, a piston-powered fighter. Yeager was undoubtedly the talk of the ready room for months on end afterwards. 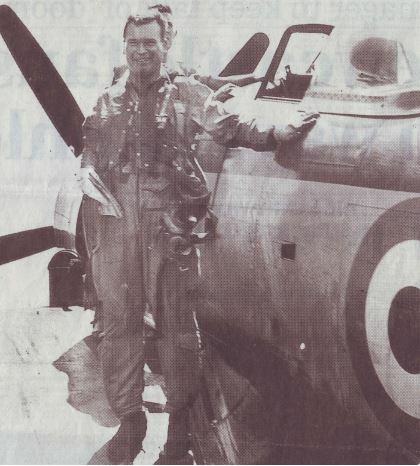 On August 9th, 1952, Fleet Air Arm Lieutenant Peter “Hoagy” Carmichael was about to find out what the experience was like for himself, flying in a Sea Fury off the HMS Ocean against a Chinese MiG-15. During the Korean War, the British Commonwealth Forces Korea (BCFK) coalition was given the use of Royal Navy and Royal Australian Navy Sea Furies, deployed aboard British and Australian flattops steaming towards the Korean hotspot. When the HMS Ocean reached her assigned station during one such deployment in 1952, 802 Naval Air Squadron, having recently transitioned to the Sea Fury from the Seafire XV, was given a slew of ground-attack missions to carry out. On one such mission, Lt. Carmichael was tasked with leading an attack flight towards a a transportation nerve center squarely between Pyongyang and Manchon, used by North Korean and Chinese forces to move around materiel, supplies and troops. The four-ship attack flight encountered the Chinese MiGs at around 0600 hours, according to Hoagy, when Sub-Lieutenant Carl Haines, flying the second Sea Fury in the formation, called in the presence of the MiGs diving out of the sun over his right shoulder. “MiGs, five o’clock.” came Haines’ voice over the radio. Rather than pull away and make a hasty retreat to the safety of their carrier’s air defense net, the four pilots broke formation and turned towards the eight approaching jets, ready to give the enemy pilots the fight they were itching for. Drawing upon one of the most reliable maneuvers taught to pilots at the time, the four pilots began moving in scissor patterns, attempting to draw their pursuers into an overshoot while presenting themselves to be difficult, if not impossible, targets to get a good bead on. Each pilot was aiming to get into position for a high deflection shot if the opportunity presented itself. The eight MiGs split up into groups of two, each flying after two Sea Furies. Neither group of aggressors were able to hit their quarry, owing to the practiced skill of the four Royal Navy pilots. In the fray of the battle, one MiG, broken away from his flight, screamed towards Carmichael. This time, there would be only room for a split-second action, and Hoagy took it, loosing a burst of cannon fire in the MiGs direction as he rushed past. Banking and then jinking away, Carmichael was unable to get a clear picture on his recent foe, but from radio chatter presumed that Sub-Lt. Haines managed to get a fairly decent hit on the same fighter too. After the third and fourth pilots in the formation, Lt. Pete Davis and Sub-Lt. Brian Ellis hurled more lead in the direction of the retreating MiG, the stricken aircraft began spewing an incredible amount of smoke. It then veered sharply off course and smashed into the ground, ending the day for the remaining MiG pilots. Within three or four minutes, the fight was off and the Chinese MiGs had learned their lesson. As they flew back to base, their British opponents formed up and returned to the carrier. Being the flight leader that day, Hoagy was awarded the kill. However, reminiscing on the event, Carmichael refused to call it an individual kill. He felt that the MiG’s downing was the result of a team effort from his wingman, Haines, and Davis and Ellis. The victor of any dogfight is generally regarded as being the luckier of the two (or more) participants, but the reality of the matter is that the winner is almost always also the better pilot. Looking back upon the dogfight and the tactics used by the Chinese pilots, their disorientation during the fight and their inability to capitalize on a speed advantage, it was probable that the MiGs were flown by inexperienced Chinese pilots who were just beginning to adapt to the airframe. Carmichael and the rest of his flight were definitely the better pilots that day. One of the first British air-to-air victories since WWII couldn’t have been done in better style. 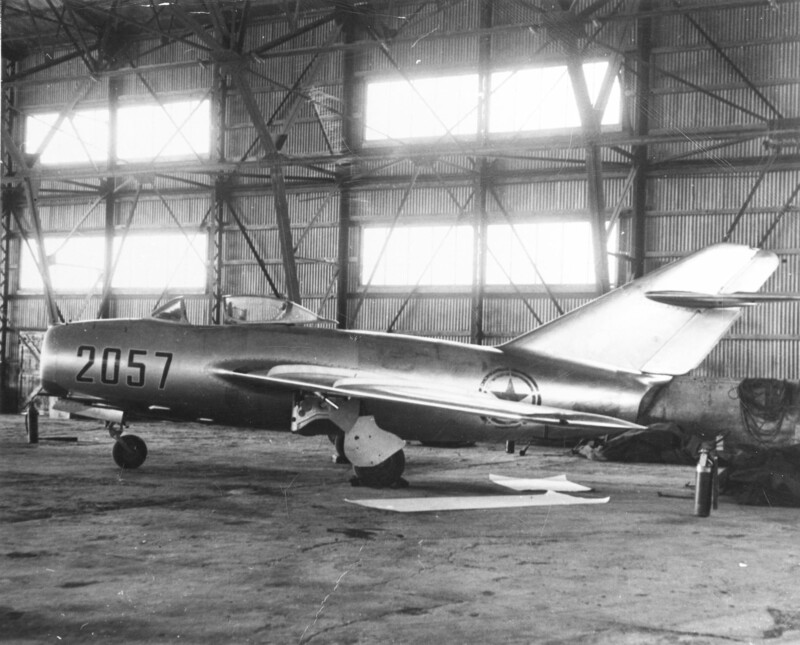 The Mikoyan Gurevich MiG-15bis of North Korean Senior Lt. No Kum-Sok in a hangar at Kimpo air base, South Korea, on 21 September 1953. Kom-Sok, who had long before decided to escape to South Korea, suddenly landed downwind at Kimpo Air Base near Seoul, South Korea, greatly surprising the personnel there. Within a day the plane was flown to Okinawa, today it is on display at the Museum of the United States Air Force in Dayton, Ohio. (USAF Photograph/Released).